As readers of this series know, the T-Bird's new transmission is a modern (1980s) Ford AOD (4-speed overdrive automatic). Its installation was chronicled in past articles, so we won't repeat any of the details here. 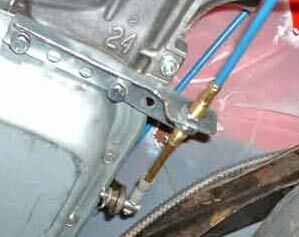 However, now that the body is back on the frame we had to solve another problem: the shifter. The T-Bird's original shifter looks just fine and we didn't need to spend much time cleaning up its straight chrome rod and black ball. Since it looks correct to the period we decided to re-use it on the new transmission, which meant we had to figure out how to make a 2-speed shifter work with a 4-speed transmission that has completely different linkage considerations — not to mention clearance problems. We attacked the problems one at a time. 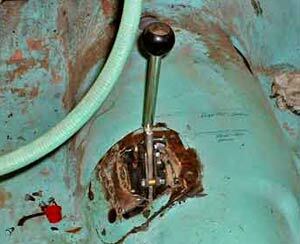 First, we procured a B&M "universal" cable shifter. The reason, frankly, is that cable shifters are the best solution for both under-floor clearance and linkage problems. 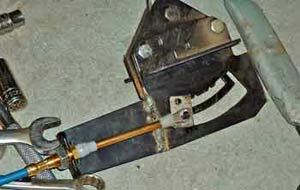 The cable can be routed in a variety of ways and the shifter's detents are self-contained. 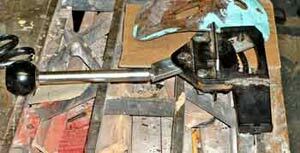 The shifter came with its own rod and handle, but we planned to modify all that to accept the original shifter rod (more later). Here's the brand new shifter as it arrived in the box. Within 30 minutes we'd void the warranty. 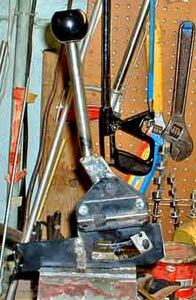 Once we'd attached the cable to the shifter and tried out the gear selection it was obvious that the movement was the reverse of what we needed, relative to the transmission's shift arm. That is, when the shifter was in Park the transmission would be in First, and so on. The transmission's shift arm wasn't reversible so we did what any pragmatic restorer would do: cut the shifter's bracket off and weld it to the opposite side! It's about to be severely modified. Now that wasn't so bad, was it? The cable moves in the right direction and there's no way B&M will take it back! 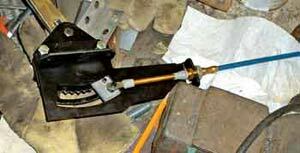 The next thing we had to do was create a fitting that would slip properly into the AOD's shift arm. Nothing was readily available (translation: we would have had to buy an adapter kit for $49 and wait for it to show up) so we machined a piece of steel rod to the proper length and diameter. After several test-fittings and a good polishing the piece was ready for installation. We also had to make a bracket for the cable's end and this was done with a piece of angle material. Turning the fitting only took about 10 minutes. The finished bracket and properly-mounted cable actually look factory-made, don't they? This part of the job was followed by some re-working of the shift-mount plate that is attached to the transmission tunnel. We welded in a new platform for the shifter and mounted everything to the transmission tunnel, then made a bunch of test shifts to make sure the mechanism would operate smoothly. The process took the rest of an afternoon but we were satisfied with the result. Now we could start the modification of the shift rod itself. 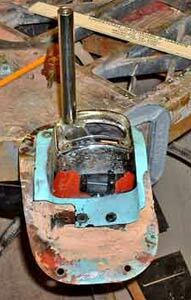 We now brought the newly-modified shifter into the workshop and started our grafting of the old to the new. After taking some measurements we made cuts on the new shifter's rod in order to get it ready for attachment to the old rod. 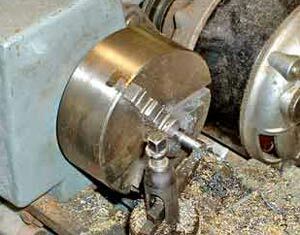 We cut it carefully, leaving enough "core" material to cut threads for attaching the two rods, since the bottom of the old rod was threaded. We then cut threads onto the stub of the shifter rod. After cleaning up the cutting oil and metal shavings we screwed on the new rod. After cleaning up the cutting oil and metal shavings we screwed to the old rod to the new shifter base and tested it for smoothness of operation. It worked perfectly, so we turned our attention to the original chrome-plated bezel that covered the T-Bird's two-speed shifter. We found we could make a few slight modifications to this piece and, with the addition of a rubber shift boot, it would cover the new shifter very well. Inside the car no one would know the difference. It's beginning to look original again. From this point we took the new assembly out to the car and reattached the cable to the shifter. The whole assembly was carefully installed onto the transmission tunnel and we were then ready for testing with the old T-Bird's shift rod. Yes, it did, and very well indeed. We started the engine and ran the shifter through a number of movements and everything functioned properly. There was just one little flaw in our system. It all fits back in the right place! What's that, you ask? To be honest, the new system doesn't let you know which gear you're in, other than "feeling" it or counting detents as you shift from Park down or First up. The detents in the new shifter body are in sync with the detents in the transmission's shift arm, but there presently isn't any way of visually identifying the gear you're in. The old bezel is marked for the Fordomatic, but those don't mean anything anymore. For now, we're going to leave it alone until we fit out the interior of the car. We'll probably create some sort of indicator needle that will attach to the shift rod, or maybe even some sort of switch-activated light system like new cars have, but we're going to use the next few months to think about it.